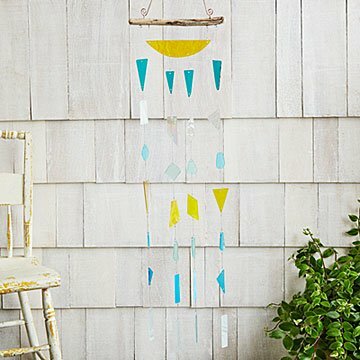 Sea and stained glass hung from Grecian driftwood make an enchanted, meditative wind chime. It takes two beaches 5,000 miles apart to create this stunning wind chime. Samara Phillips collects the colorful bits of sea glass in South Carolina, and sources one-of-a-kind pieces of driftwood from the crystal blue shores of Greece. But perhaps the most unique touches (if not, the sparkliest) are the rectangles of stained glass she makes at home. Send one to a beach lover or hang the piece on your front porch and enjoy its soft, meditative clang in the breeze. Handmade in South Carolina. You might say Samara Phillips’ love for creating started in her high school metalsmithing course. From there, she took workshops at the John C. Campbell Folk School, where she worked with watercolors, glass, and wood. As an artist, it’s important to Samara to use a variety of new materials and constantly learn new techniques. When she’s not experimenting at her studio, you can find her scouring the used bookstore for crafting books or designing custom frames for a local art gallery. She lives and works in South Carolina. Hang delicate glass inside or under shelter. Take indoors during storms or high winds. Clean with damp cloth or glass cleaner when needed.